NokiaCooker is a useful tool for the users who need to customize their Symbian phones by making changes to the operating system. The program allows you to load the firmware content in order to remove unwanted applications, add your wallpapers or extract certain files. In other words, NokiaCooker is a PC software reserved to the Cookers, which allows to modify the files containing the phone's firmware to create customized firmwares versions named Cooked-Firmware. Simply stated, this tool allows you to modify the firmware files for Nokia phones in order to create a customized operating system. In order to replace the operating system from a mobile device you need to flash its memory with a new version. Although the operation is rather risky and might render the prone useless, you can find plenty of custom firmwares on the Internet. However, these files often include components that you do not want on your phone and you need to remove before installing the new OS. This program allows you to browse the files included in the firmware file just like browsing through a computer folder. Since this is a portable program, it is important to mention that it doesn't leave any traces in the Windows registry. You may copy it on any USB flash drive or other devices and take it with you whenever you need to remove data from firmware files. The program can load the firmware from VPSX and VPL files in order to make changes to the files from UDA, CORE, ROFS and ROFx. A partition manager is also included if you need to change the space allocated to each of the partitions. You can extend the program usage by installing plug-ins which can be launched from the program interface. The package includes the NaviFirm Plus app which can be used for downloading custom firmware files for your device. After removing the unwanted items and adding the desired files you have the option to repack the files by choosing the data from FAT or ROFS. 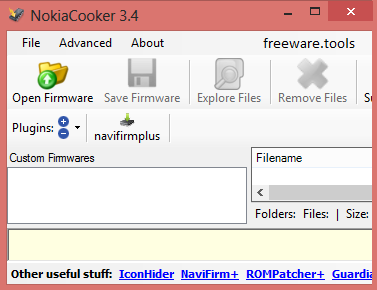 Whether you need to add or remove files from a Symbian firmware, the NokiaCooker application allows you to make the changes and repack the file in order to use it on your device.